This quiz is based upon minutia from the book. No Internet questions, chapter titles, etc. Designed to quiz you on how well you have retained what you read. 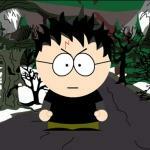 This quiz is a continuation of my previous quiz "Harry Potter Book 6 Beyond Expert"
Think you know Harry Potter well? Let's see. See how well you know the details of this book! Be forewarned a few of the questions are really hard! This is for those who have just read Harry Potter 6 and so this is easy! Are you a real Harry Potter [6!] fan? Test your knowledge on Joanna Kathleen Rowling's Harry Potter! This is ONLY testing your knowledge on the sixth book. The Ultimate Harry Potter and the Half-Blood Prince Quiz! How well do you know Harry Potter and the Half-Blood Prince?